I would like to start by making a confession to both of you who likely read my blog. I hang my head today and humbly admit that my five-year old has taught me an important lesson and is schooling me in the hotly contested Logan Family NCAA pool. Please note, my wife and I gave our 5-year old the nickname “the coach” because of how she would always say “I get to be the coach” when we would try to con her into being quiet on family road trips. She was one step ahead of us, and the name “The Coach” has stuck. Other nicknames include “the Dude” for her propensity to don a robe for outings or “The Girl in Black” for the period when she only wore black leggings and a black top looking like a small, sweet Johnny Cash. Our family does a bracket. 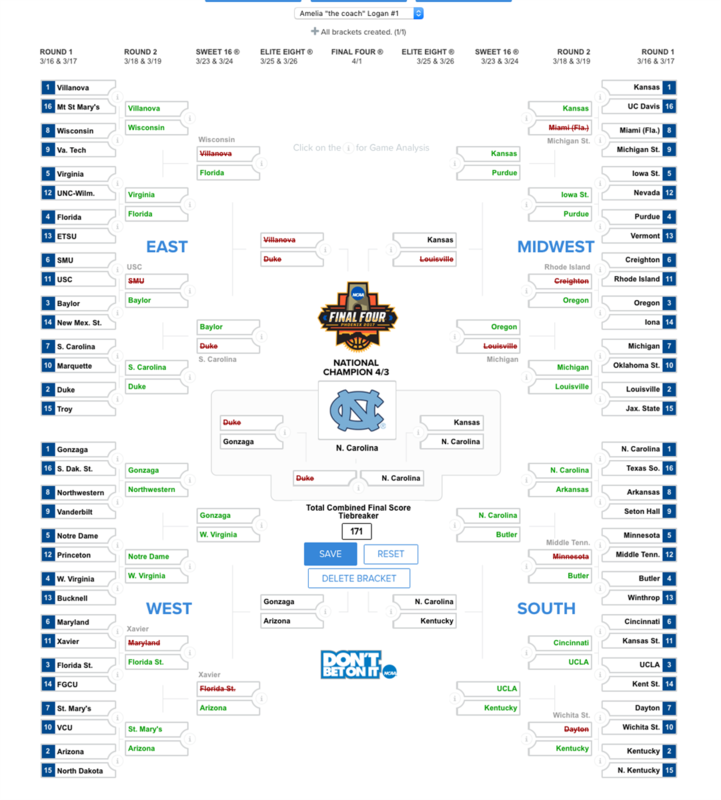 It is not a big money NCAA bracket, it is just for fun and another occasion to hang the “free rent for a year” prize I so often love to dangle in front of my five year old Amelia and her 7 year old sister Lila. My wife Evan and I may be secretly crazy competitive and it adds a little fun to watching the tournament. My 7-year old Lila reads each team and based on what I can tell makes picks based on what sounds the most familiar. If closely analyzed, this could be the same rationale that I use with some of the less familiar teams that I choose. My wife is the thrill seeker and her strategy is to pick the upsets mostly. Her joy in picking one upset outweighs her joy of picking 10 correct wins with the top seed winning. Amelia asked a few questions about the numbers next to the teams this year. From that, she did something that truly annoyed me as a parent at the time. I would tell her each team name and she would say “the top one.” She soon lost interest and would say “the top one” before I could even get the first syllable out. She completed her whole bracket like that. As regions collided with four one seeds, she picked the teams. Fast forward the first action packed weekend of March Madness. 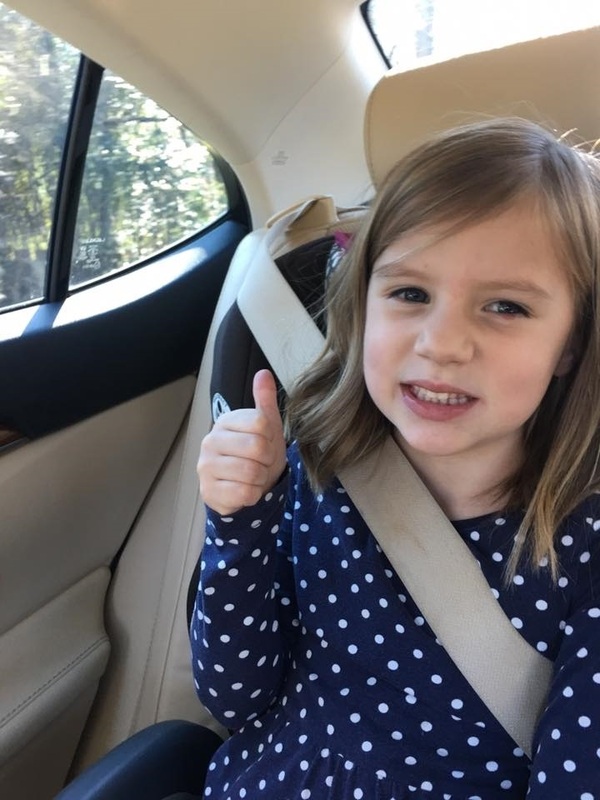 Who in the Logan family while achieve coveted bragging rights and the coveted “free rent for a year our stupid dad jokes about.” Lila has been way more interested in cartwheels as of late although she does seem to enjoy watching her father’s beloved Tar Heels. Maybe this is the brainwashing beginning to pay off or she enjoys it, I may shed a slight tear that she at least humors me through a whole game. She was hurt by her familiarity with “Miami? and their early exit. She did have some success with her Xavier upset over Maryland, as schools that start with an “X” are pretty cool, we all must admit. There were of course a few upsets. My wife somehow had the Michigan over Louisville pick. I just thought that Michigan with their wild run in the Big Ten had to have their magic fairy dust run out or even just run out of gas after the wildly frightening situation with their plane skidding off the runway less than two weeks ago. My pics once again are nothing to brag about as I am in a distant third behind my wife Evan in second. Wait, who is the winning bracket thus far? Yup, you guessed it. Amelia “The Coach” Logan is holding on to a strong lead. Why? Certainly her numbers dork dad had to dig in a little further to look. Financial Rule One: Build a system, and stick with the system. A great financial plan is a road map that provides a plan and a system to get there. Stick with your system. Changing systems halfway through the journey can be devastating. There are different strategies that you can take towards your retirement goals. Sometimes changing strategies frequently can be a detriment to achieving these goals. Don’t second guess yourself, stick with the program. This is same with the system for your investments, for those of you who do not have an investment policy statement outlining guidelines for your investments, this is a huge part in building a system to help you navigate your investments. Financial Rule Two: Don’t get emotional about it. Amelia showed no emotion. In fact, she showed what looked to me like a lack of interest. Emotion is dangerous when it comes to your investment and your financial lives. Remember when you bought that time share because it felt good after 9 rum drinks on a cruise? Maybe you bought a hot stock that had already grown 1 billion percent just on the gut feeling you had? Amelia knows she cannot read. She can decipher numbers though, and as soon as she discovered their meaning, she was off to the races. If you do not have time to build a plan or a strategy, you need to find someone who can. If you will never get around to it, know that you second guess yourself frequently or know you don’t have the interest or expertise, enlist the help of others who can provide this service for you. Amelia discovered rankings and chose that way. Whether she knew it or not, this strategy is statistically strong. If you pick the higher seeded team, more times than not, you are going to be correct. When you build out your investment portfolio, do not try to be cute or smarter than the market. Over time, you will be disappointed. Build a portfolio that gives you the highest chance of succeeding, not the portfolio that is flashy and picks the upsets. A portfolio should be made up of top level teams. There are still winners who are not in the top 25 in college basketball. Just pick the stronger one of the two. Eight seeds beat 9 seeds most of the time, pick that way. Amelia was 75% in her bracket with this strategy. Ultimately, a lot can happen for Amelia in her bracket as we are only at the Sweet 16 thus far, but there are a few things that she did that I would bet that many of you would not. There are also a few more lessons that I have learned from my 5-year old to add to the long list. These lessons are a little more helpful than the words to the Trolls Soundtrack or the names of all the Disney Princesses. Maybe some of them will help you on your bracket and more importantly next time you visit your financial plan.